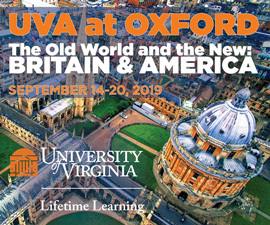 I graduated from UVA’s School of Architecture in 1979. After that, I worked for Robert Vickery in his Charlottesville office (now VMDO). Bob was very kind to hire me. I didn’t know much, but I was good at building models and generally understood construction so he must have seen some glimmer of hope. I will always be indebted to him for that. After about a year, I felt like it was time to get out of Virginia—honestly, I was kind of tired of everyone wanting brick buildings—so I decided to move to San Francisco. The only problem was I really didn’t have the money to make the move—but once again Bob came to my rescue. He had this idea to build a small cabin on this beautiful 100 acre piece of property that he had in the Blue Ridge Mountains, and he paid me to build it for him. It was a magical project, this perfect little jewel to which we had to hand-carry all the materials up a mountain. It was an experience that affected me profoundly. 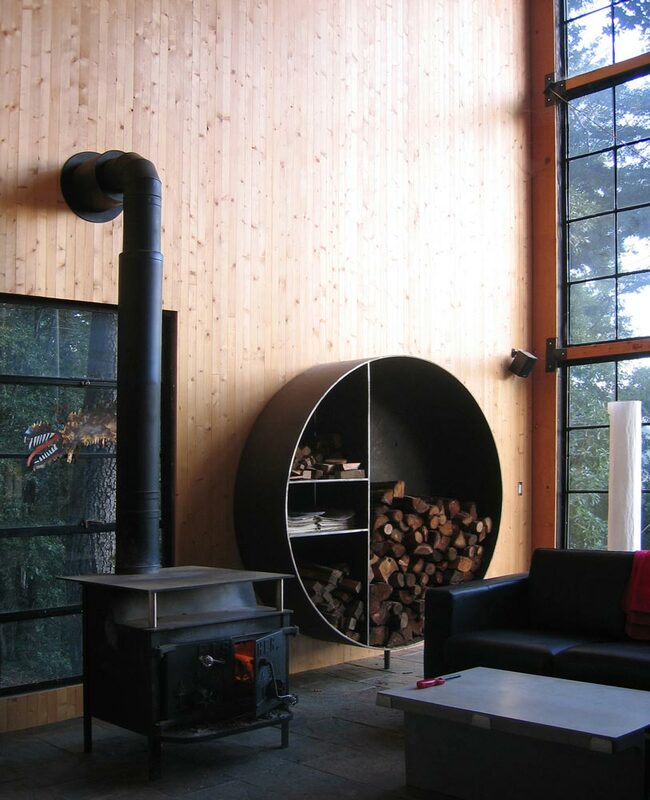 My cabin, which is in the hills of Sonoma about a mile inland from the Pacific coast, is my most personal piece of architecture. I have personally built all of it—sometimes with friends, often alone. It is my version of therapy. Running an architectural practice requires me to be constantly multitasking, but when I am working on the cabin I try to only concentrate on that—to just do one thing really well. In a world where we all become further and further removed from the act of making something, from the handmade, from the craft that produces individual works—it has been quite an experience to actually build my own house. 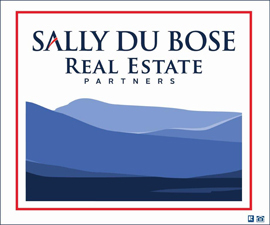 My wife, Mary, and I bought the property about 15 years ago. It is 16 acres of redwoods and tan oaks that sit on top of a ridge and overlook the virgin forest of the Gualala River canyon. We started by putting in Mary’s garden, since I knew she was going to need a project while I worked on the construction. It’s interesting how literal that tie to the land actually is. We started with wanting to grow tomatoes, but now, after several expansions, we have a citrus orchard, olive trees, grapes, kiwis, figs, Padron peppers and every heirloom tomato Mary can put her hands on. At its height, the garden feeds my office. The cabin itself is small, less than 1000 square feet. It is a very open plan with the only separate room being the bathroom. The bedroom is a second floor loft that overlooks the living space. 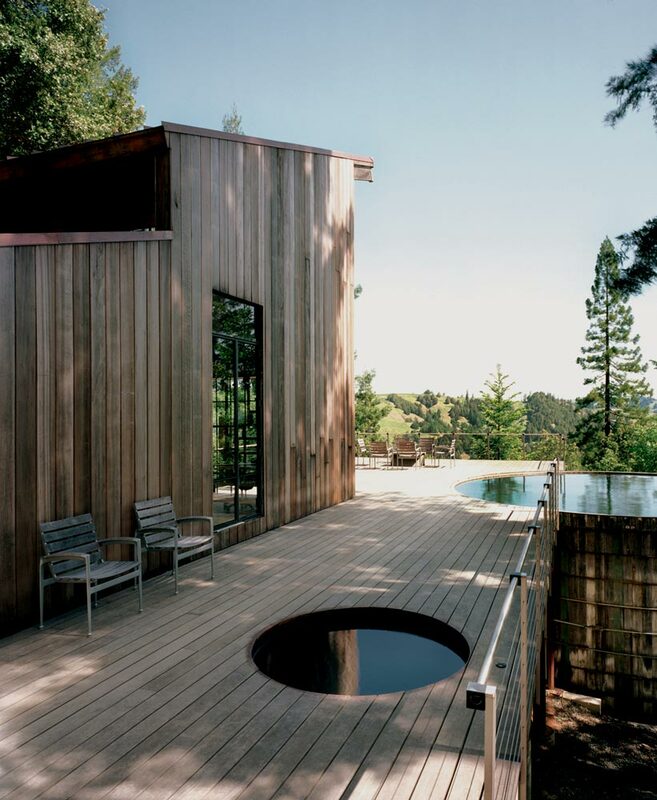 The deck at 1500 square feet is actually larger than the cabin, and we salvaged a giant redwood water tank—from a client’s project—and turned it into a swimming pool. 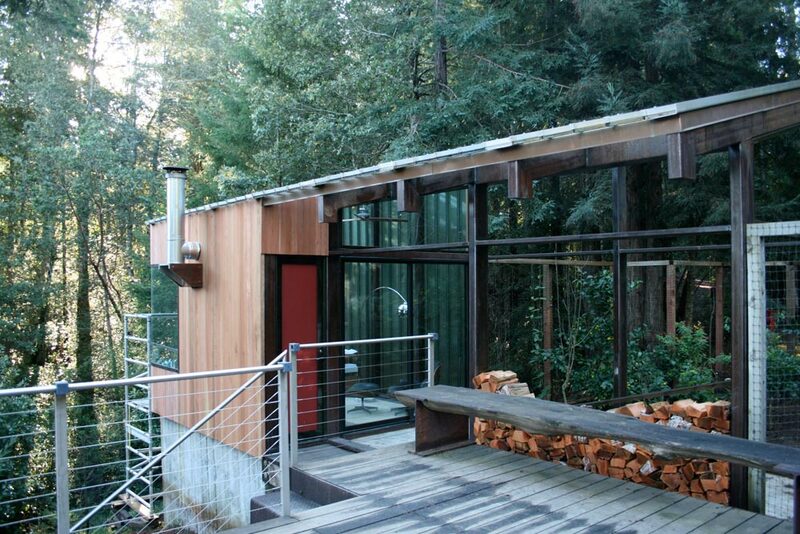 It is a simple shed roof structure—as was Bob Vickery’s cabin—that opens out to the view to the north. 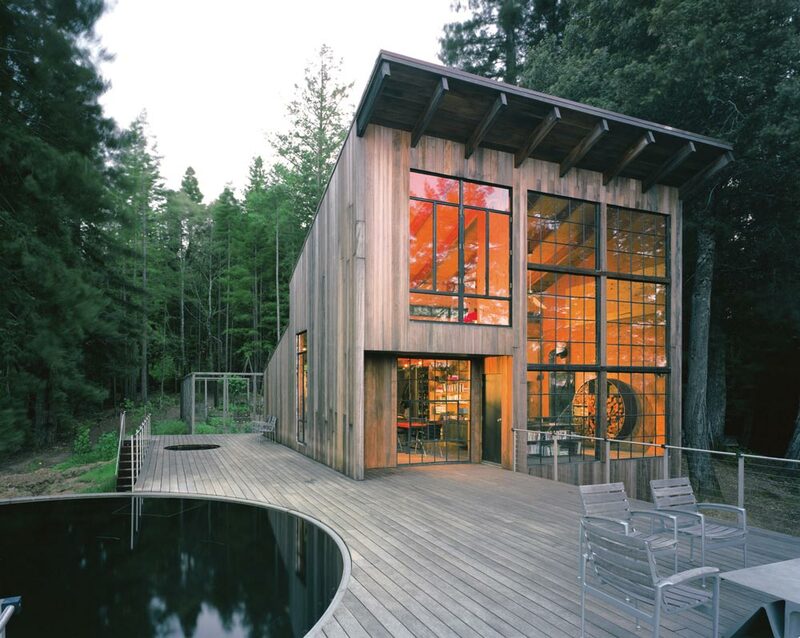 All of the windows are steel industrial units salvaged from various remodel projects. A few years ago, we then decided to build an office and greenhouse structure for Mary, and while I stayed with the shed roof form, I decided to explore more of a steel and glass technology. The roof is actually a standing seam glass roof, and the building feels very much like a glass box inserted into the redwood forest. 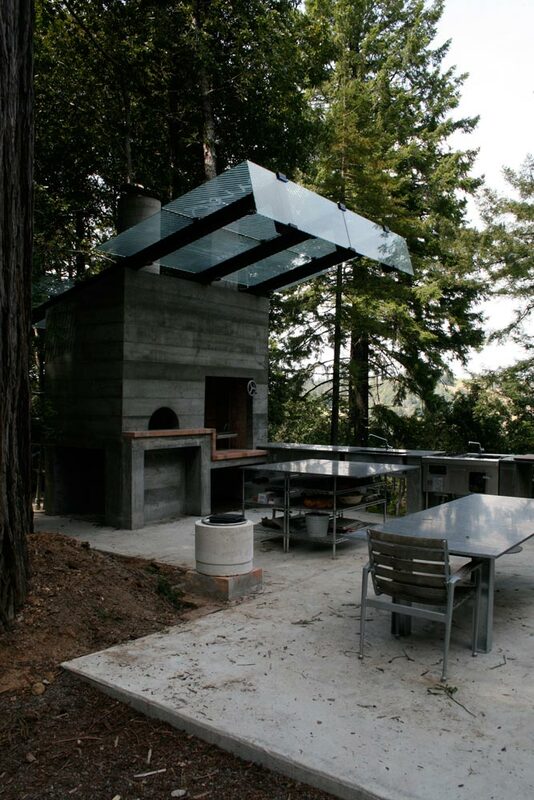 This year I decided to build an outdoor kitchen with a pizza oven, cooking fireplace, commercial wok burner and even a tandoori oven. Again, we stayed with the shed roof, but this time we explored the properties of concrete. My firm designs a lot of restaurants, and many of my friends are chefs, so this kitchen is probably built as much for them as it is for me, but I am looking forward to learning from them. For us it is magical place. A place of retreat, a place of entertaining, a place that speaks to who we wish to be. It is also my dog’s favorite place in the world. I am sure it will never be done, there is always another project on the horizon, but that process of building is so much the source of my passion for the place. My time at UVA’s Architecture School started me on this path—running the woodshop didn’t hurt either—and the beauty of the hills of Northern California often remind me of the Blue Ridge. I will always be grateful to Bob Vickery for teaching me how to gently, yet with conviction, build upon that landscape. 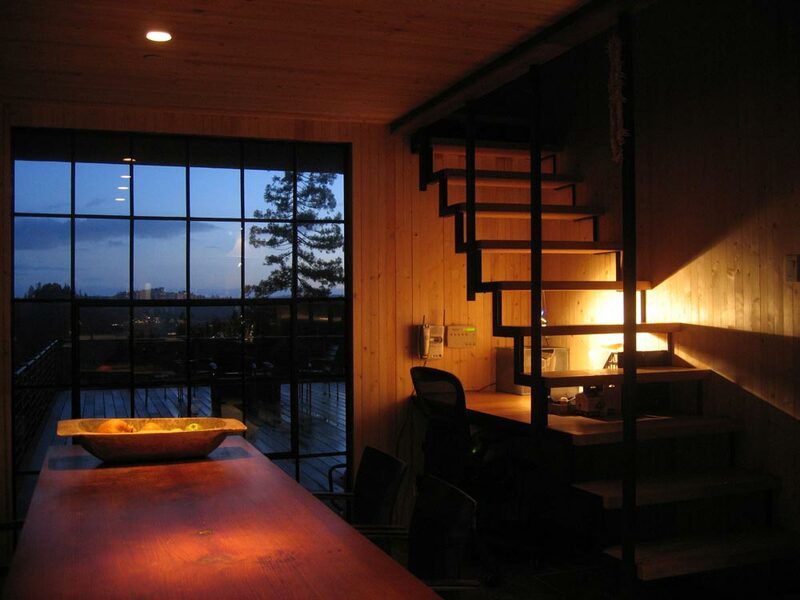 T. Olle Lundberg in an architect in San Francisco.